Last week on my return flight from Maine to Oregon I had a layover in New York at JFK's JetBlue terminal. My next plane wasn't leaving for 3 hours so with cameras in tow I decided to explore a little. I walked through security and baggage claim to the outdoor pickup area, where I was surprised to see this building across the way. Hey, I thought, I know that thing. It's the back cover of Arrivals & Departures turned inside out. What would the place look like now? Immediately my course was clear. I had to go inside that building to revisit the scene of the photo. It took me roughly 10 minutes of exploring before I realized the terminal had no access. The building was closed, and in fact had been for years. The long tunneled walkways jutting promisingly toward me had been permanently sealed, and the only other route required dropping 30 feet down into the terminal's basin. Apparently Port Authority is converting the thing into a boutique hotel, but I saw no signs of work while I was there. It was a relic. OK, so I'm a total bumpkin. Most New Yorkers must know the TWA terminal is closed, but I don't live there. Can I be expected to keep track of such things? Feeling stupid, I redirected my exploration to the operating parts of JFK. I took the train around to all the other terminals and walked here and there, and shot from a few parking garage rooftops. All in all I got a good 360 degree view of the TWA terminal but I never made it inside. 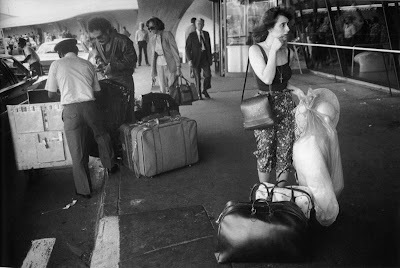 I don't know the story behind Winogrand's photo. I'm not sure if he made special shooting ventures to TWA or if he just shot while passing through. Whichever the case, he seemed to have an affinity for the scene. 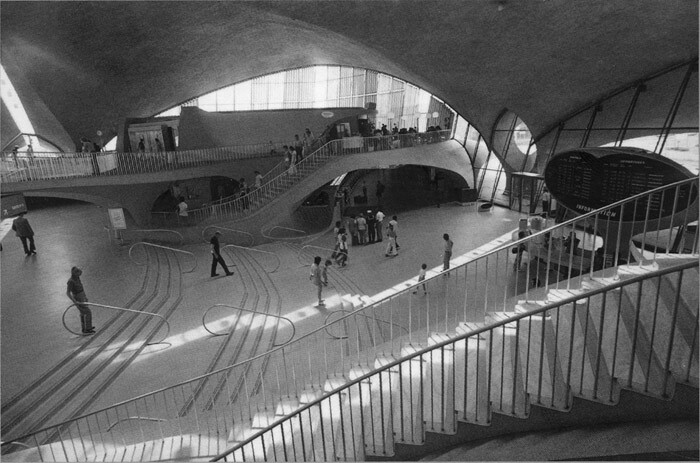 At least three of the photos in Arrivals and Departures were shot there. And why wouldn't he feel an attraction? The building is stunning. Don't get me wrong. The new JetBlue building is also nice. It's very chic and European and (a rarity for an airport) it even offers wholesome food. 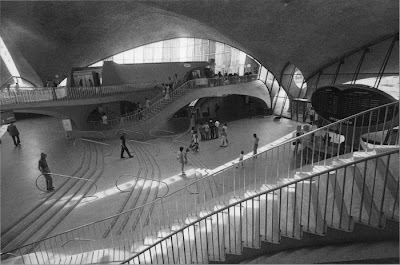 But the TWA terminal... they just don't build them like that any more. 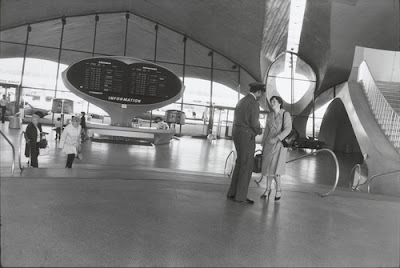 For a guy shooting 28 mm like Winogrand, that background was money. Nowadays shooting in airports is different. Cameras monitor every corner. Security personnel are rampant. Airports operate as police states. A terminal is still a quasi-public place and you can still shoot there (though not at the actual security clearance) but let's just say the vibe can feel off. I walked around for three hours at JFK and barely got through a roll. Who knows, maybe the police state was all in my head but I didn't feel like pushing it. I made my connection without creating an incident. Back in Oregon I had a few days to readjust before taking off with some friends to Olympic National Park. 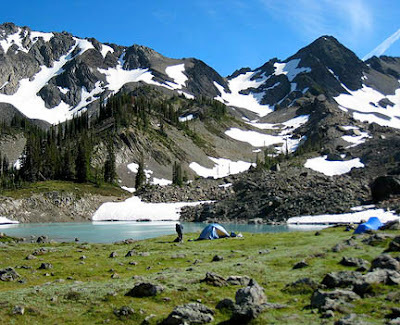 We spent a day hiking into Royal Basin in the extreme northeast corner of the park. The basin was about 8 miles from the trailhead and 10,000 miles from the online photo world. We set out the next morning for nearby Mt. Clark in perfect conditions, not a cloud in the sky. It's been a huge snow year in the west, and snow covered much of the loose scree on the hike up which sped our progress. By midmorning our route was in view. As the photo shows the route (in red) goes up through a notch in the SE ridge. 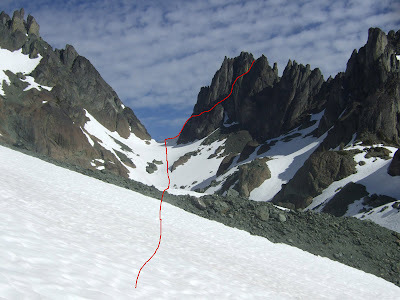 From there we were to traverse around the backside of the mountain and look for a 3rd class gully to the top. I'm not sure who wrote our guidebook but it veered from reality. The traverse turned out to be a nasty 4th class downclimb to a steep heather bench. From there we followed ledges and gullies north, but we were cliffed out within a few hundred yards. In front of us was a sheer wall of snow. Maybe it hid a 3rd class gully but it didn't look very likely. Above and below was vertical rock. Summit access denied, for the second time in a week. Or, to use a term from the photo world, our work was deaccessioned. 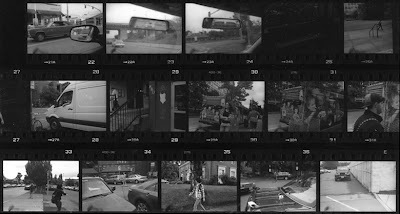 When I returned home I began developing film from the past few weeks. I'd let it fester before leaving for Maine and then shot a bunch there, so I was looking at about 35 cartridges plus a medium stack of 120 rolls. After the first batch I knew something was wrong. There was a mark on the lower left corner of every frame. What was that thing? Something on the lens? Something in the processing? Was it inside the camera? I removed the lens from my Leica and immediately saw the culprit, a small sprig of film stuck between the shutter and the camera body. Using pliers I removed it easily, but with the sinking realization that every frame I'd shot in the past few weeks would bear that mark. Maine, JFK, the Olympics, all of it. With impeccable timing the sprig had gotten in there just after my last batch of processing and before the next huge batch began. For all the frames in between, complete access to the lens was denied. If I'd been shooting an SLR or any sort of digital camera I would've noticed it right away. If I'd processed film more immediately I could've been nipped it in the bud. But my combination of rangefinder and delayed processing (I like a gap between shooting and editing) had really screwed the pooch. It's now about a week later and I've processed most of the rolls. Many of the frames are salvageable. Sometimes the mark is in the shadows. Sometimes it is out of focus and blends in with the scene. But for most of the frames there's no fixing things, unless I want to collect them under a title: The secret film sprig series. That little mark in the corner? I meant to do that. What's the matter, can't you tell it's art? No, that probably won't fly. Oh well. That'll learn ya for letting your films back up. I've had a similar thought for a few years which I often vocalize to my photography friends. Being able to take good pictures is one thing. But if one an combine that with access, it's a winning combo. If the paparazzi has taught me anything, as in the ending of the documentary film "Smash His Camera," access cannot be underestimated. But it's not only access to the famous: it's access to just about anything of interest. I have one friend who is a rock climber. How many great rock climbing photographers are there? I'm guessing not too many. In this day and age of photographic democratization, separating oneself from the fray is one path that is almost decidedly clear from obstruction. 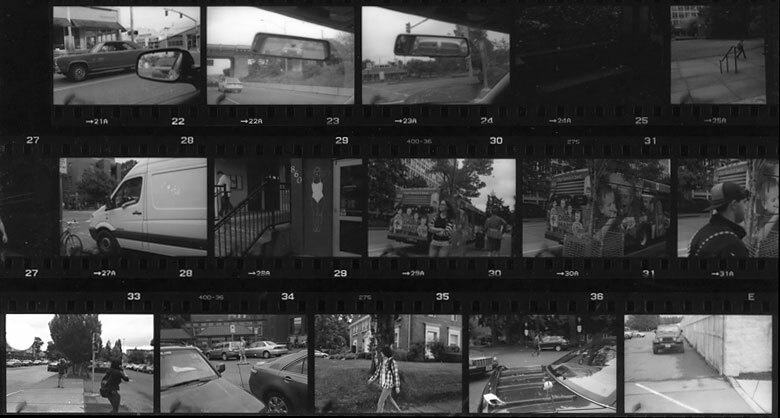 I once shot 36 frames with my Leica M6 only to realize as I was rewinding the film that I had loaded it wrong and it never advanced past the first frame. Now I religiously feel for the spinning film rewind knob every time I advance the film. RE the misloaded film, Been there, done that, as I think we all have at one point or another. RE climbing photos, I was actually quite into rock climbing as a young adult. There are some great photographers of that scene. 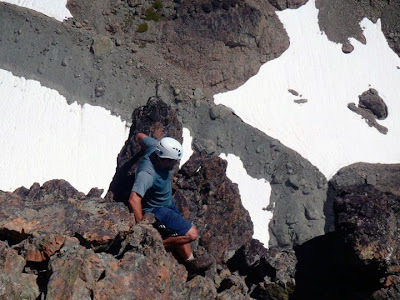 The Abraham Brothers, Galen Rowell, Greg Epperson, and Ron Kauk come to mind, and when you stretch things into the alpine world things get very interesting with Sella, Washburn, etc. It's about access, but also about having a good eye. By the way anyone knows what it this terminal shot by Vivian Maier ? Sorry for your negatives Blake. I'm curious if those rock climbing photographers you mentioned are doing it in some traditional sense of sport photography. What I was getting at is about making narratives. In that sense, having a unique skill/access can be the beginning of a documentary photography series with portraits, the life, etc. In other words, instead of simply a focus on great climbs or gear, what about great portraits of climbers or their rituals or tied into their travels? i.e., a story. Smash His Camera ended with Galella looking dejected since the stars are so protected, competition is so fierce, and the expected quality of the photos is so low. Have a skill, like climbing or schmoozing, could get one beyond the competition and make for some unique photos. For one gig, I was given all access backstage for a concert. It was pretty amazing to have that access. As per John's comment, I too (along with a couple of other photographers) had almost unlimited backstage and front of house access to a very large concert a couple of years back. The series I produced from that night are some of my favourite images. I think having sanctioned access with requesite "Press Pass on Lanyard" removed an entire element of doubt and allowed me to concentrate solely on the images. "1978-83, Garry Winogrand (not in A & D)" may be my favorite of his airport photographs. Szarkowski included it in his survey of Winogrand ("Figments from the Real World"), but I find it curious Friedlander did not select the photograph when he edited A & D.
On a side note, I'm surprised that Livestock Photographs hasn't received a single vote in your current poll. I remember reading somewhere that this was Szarkowski's favorite series of Winogrand photos. Re: Goldsmith's question about climber/photographers. Glen Denny comes immediately to mind. Re: Access. For me, the best pictures have little to do special access to a guarded subject. They are more likely to be of something that is right in front of us all the time but we just don't see. Stock Photographs is indeed underrated. I think the problem for a lot of people is the images just look like stock photographs. Gary, I agree about access. I think public places, which by definition offer equal access to all, generally offer the most fruitful photographic material. 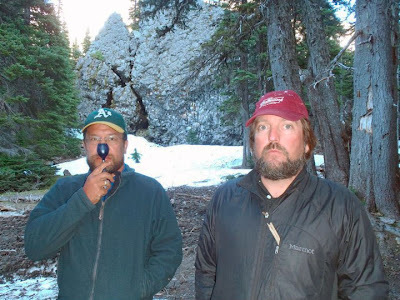 Gary and Blake - Let me expand: great photographs can be taken anywhere. If I didn't believe that, I wouldn't put so much effort into roaming my neighborhood taking candid photos of strangers. But if you look around today at the pictures being made, you will notice that a lot of them look familiar -- even the good ones. My point about bringing up access is that it is another element to separate one's photography. Trent Parke's Sydney Opera House comes to mind. "that it is another element to separate one's photography"
Not saying that there aren't great images to be made staring us in the face but having unfettered access to a subject in the way that (I think) John and I are discussing, adds a dimension that can add to the images. For example with the images I spoke of previously, my favourites are those looking back into the 80,000 plus crowd from the stage area. Without that access, they simply wouldn't have been possible. 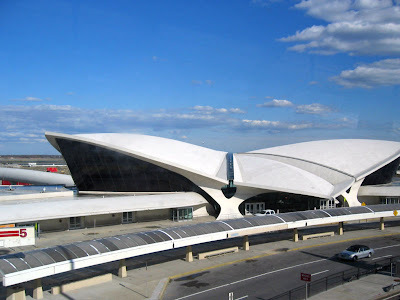 Totally irrelevant to most of the comments, but the TWA terminal is really interesting because it's really interesting. 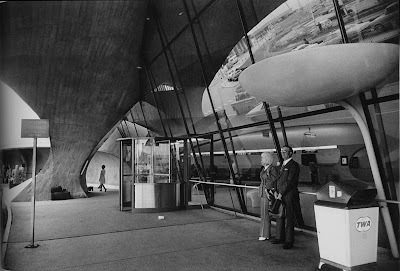 It's one of the iconic works of Eero Saarinen, the Finnish guy, who also designed Dulles airport and the St. Louis Arch, among other things. Saarinen also designed the women's dorm at 30th and Walnut in Philadelphia that I lived in my freshman year at college. Six stories of rooms surrounded a giant atrium, with one access to the exterior through a long slender path. The rumor was that he had designed it to represent a womb, and it pretty much did. Gosh I was way off the mark... How ignorant I am... Thanks for the info Chuck. Are you an A's fan??? Hoping so. Yes, since 1978, through thick and (more commonly of late) thin. Blake. First thing I'm doing when I move to Oregon in the new year is to have you take me to the peak of Mount Hood ... or you may pick another mountain/range if you've been to Mt. Hood too many times!